Disclosure: This event and trip to LA was an all expense paid journey sponsored by Disney. All thoughts, experiences and Disney character crushes are 100% my own! Last week I had the awesome opportunity to travel to LA to cover several Disney events one of which was a press junket for Star Wars Rebels which premieres tonight (FRIDAY, OCTOBER 3 (9:00 p.m., ET/PT) ) with a one-hour movie “Star Wars Rebels: Spark of Rebellion,” on Disney Channel. The half-hour series will premiere on Disney XD on MONDAY, OCTOBER 13 (9:00 p.m., ET/PT). 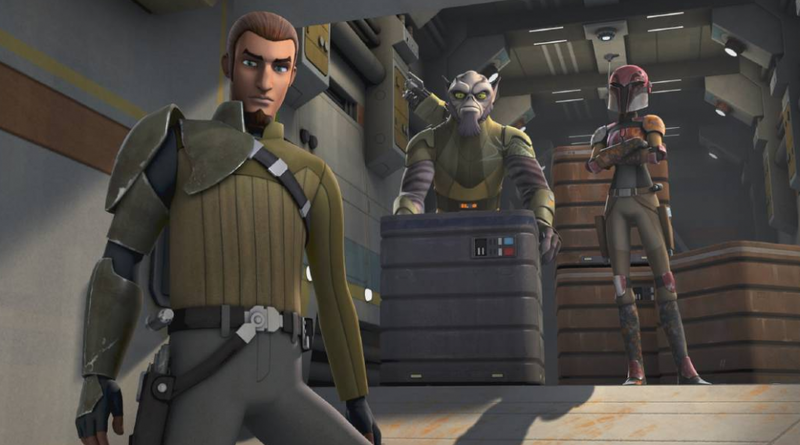 Star Wars Rebels continues the epic tradition of the legendary Star Wars saga with all-new exciting, action-packed adventures. Set between the events of Star Wars Episodes III and IV, the story unfolds during a dark time when the evil Galactic Empire is tightening its grip of power on the galaxy. Imperial forces have occupied a remote planet and are ruining the lives of its people. 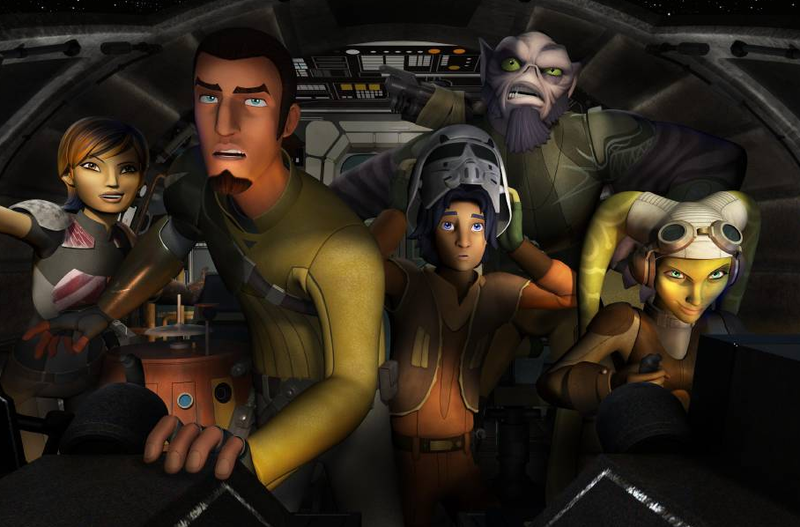 The motley but clever crew of the starship Ghost — cowboy Jedi Kanan, ace pilot Hera, street-smart teenager Ezra, the “muscle” Zeb, warrior firebrand Sabine, and cantankerous old astromech droid Chopper — is among a select few who are brave enough to stand against the Empire. Together, they will face threatening new villains, encounter colorful adversaries, embark on thrilling adventures and become heroes with the power to ignite a rebellion. This film is full of Star Wars action and I love that it is so family friendly! Perfect for family movie night! Sometimes when auditioning, actors don’t even know exactly what they are auditioning for. Freddie told us that he didn’t initially know that he was auditioning for a Star Wars show. The audition was code named ‘Wolf Pack’ to keep the true identity hidden, but Freddie said that he was tipped off to the possibility that it could be Star Wars when part of his script involved a “sun sword” instead of a light saber. At one point he actually asked them “Is this Star Wars? ?” You could tell from his excitement, that Freddie has been a huge Star Wars fan for many years so it is very fitting (and really awesome!) that he ended up being a part of the saga. When asked where the ideas for Star Wars Rebels came from, Dave said: “We wanted to come up with something new that represented this kind of new era of Star Wars and working with Lucas Films Story team, we all quickly came up with the idea of Star Wars Rebels. The Story Team introduced the idea to make an A-Team like scenario and it just makes sense. Both Freddie and Dave commented on the importance of the strong female characters in the show. It’s true that there has never been a shortage of strong female characters: Leia (Star Wars trilogy) and Ahsoka Tona (Clone Wars). I love that the Star Wars Rebels cast boasts some pretty tough chicks as well: Hera (voiced by Vanessa Marshall) and Sabine (voiced by Tiya Sircar) and they are both very strong both mentally and physically. Freddie gave us some insight into his character: “He’s not the normal Jedi. He’s not together. He doesn’t have it all figured out. He has maybe 3 answers. Forget ALL the answers and then two of them, he’s guessing on. You’ll literally see him sort of BS Ezra on some of these force things that someone like Master Yoda would be like, there is no try, there’s only do. Where Kanan will be like, give me your best shot. You’re not supposed to do that. He makes mistakes cause he was young and he didn’t get to complete his training in the way that an Anakin or the way that Luke could. He’s not the Master that Ezra, that a kid sees. Growing up without a Father like Ezra, you put certain men in your life on a pedestal. And they become something to you. They become something special and spiritual and powerful. ” ~Freddie Prinze Jr. The fact that Freddie grew up as a big Star Wars fan, made this all tie together perfectly and I loved his parting story about an incident that he had as a child: “I slipped down the slide when I was 4 years old with a broken flagpole because I was Luke and my cousin was Darth Vader. The pole hit the ground first and it stuck in my chin and my Mom ran out and my chin blew out. And she flipped and threw me in the car and took me to the hospital and they stitched this little scar I have back here. And so you know, all those images start racing back through your head and you’re reading dialogue, telling a kid, come with me. Come learn the ways of the Force. From 4 years-old to 38 years-old. It’s easy to know that I really care about this.”~ Freddie Prinze Jr.
Don’t forget to tune in tonight!! 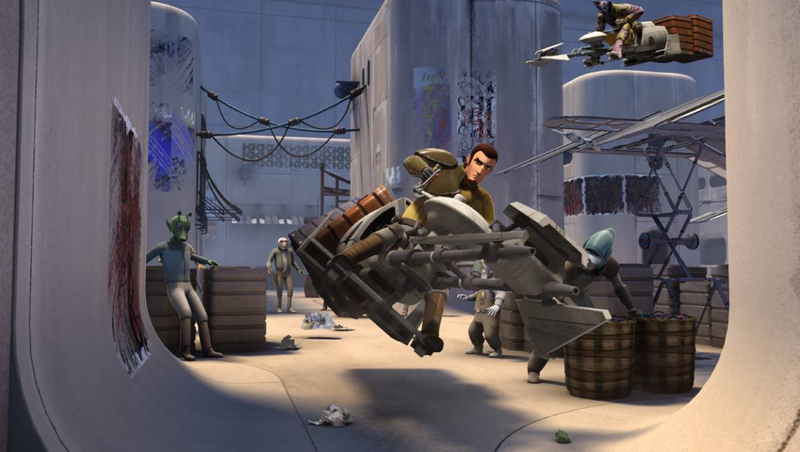 Star Wars Rebels premieres tonight (FRIDAY, OCTOBER 3 (9:00 p.m., ET/PT) ) with a one-hour movie “Star Wars Rebels: Spark of Rebellion,” on Disney Channel. The half-hour series will premiere on Disney XD on MONDAY, OCTOBER 13 (9:00 p.m., ET/PT). You can visit StarWars.com for more info on the series and follow @DisneyChannelPR and @StarWars on Twitter to see all the latest scoop! As always, a very, very special thank you to the folks at Disney for this wonderful and once in a life time opportunity that I will NEVER forget!